The photographic series analyzing the architecture of police stations in the Paris banlieues as representative and reinforcing force of the degree of antagonism from the police to the residents of a given municipality continues here, as well as in the current issue of The Funambulist Magazine dedicated to the police. The photographs and map presented here attempt to show that architecture also constitutes both a symbolic and real weapon for reinforcing the sustained antagonism developed by the police against the banlieue youth. In the wealthy neighborhoods of Paris and the western, white, middle-class banlieues, the architecture of police stations is mostly divided between heritage buildings or new, relatively transparent, and welcoming buildings. 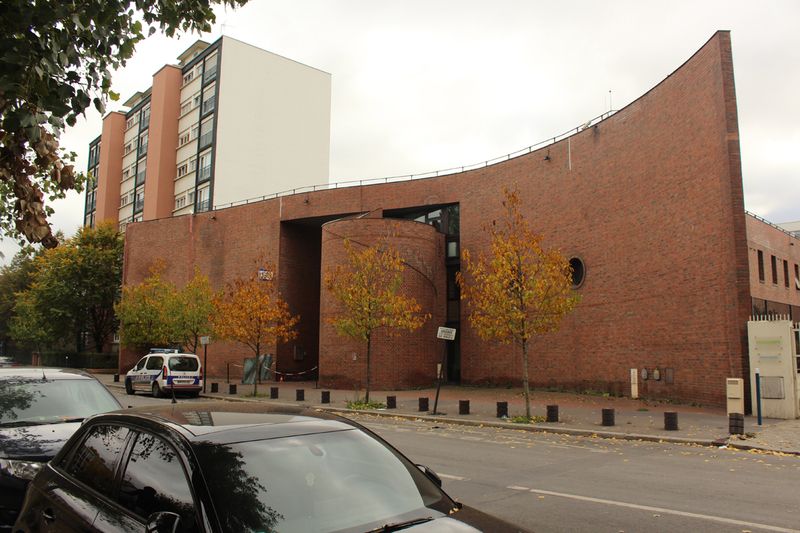 Conversely, in the northeastern and southern banlieues, where working-class and racialized neighborhoods are the most common, the architecture of the police stations, and in particular those built since the 2005 revolt, attests to and enables the police’s (and by extension, the State’s) antagonism towards the neighboring residents. The most recently built police stations attempt to present themselves as authored works, designed by architecture offices that also build libraries, schools, housing, etc. However, the cultured aspect of these stations fails to hide their capacity to respond to the potentiality of a “siege” undertaken against them, in the police’s fantasy of a conflict that would involve no restraint. These stations’ ground floors do not have any windows, or when they do, they echo medieval arrow slits; the walls sometimes present various degrees of inclination, a well-known technique by 17th-century fortress architects; the entry sequences are controlled and uninviting; and the sidewalks in front of their entrances are made inaccessible to vehicles through the presence of metallic cones and furniture. 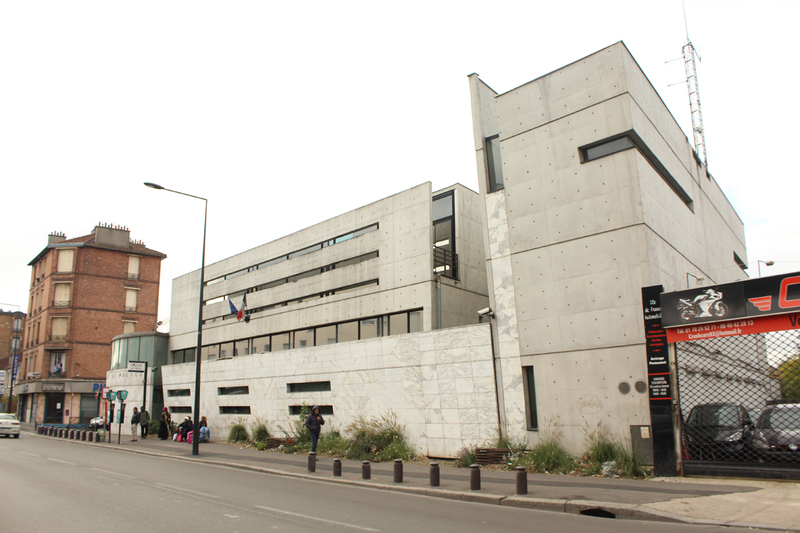 The fact that the architecture offices that designed these police stations and, as such, contributed to the police infrastructure of the city do not necessarily advertise on their website such a contribution — to the notable exception of XTU, that proudly displays its design for the Plaine Saint-Denis police station on the first page of its website — can be reasonably interpreted as a partial understanding of their responsibility. The following photographs are accompanied by the average income in the concerned municipality and the correlation between this number and the aggressiveness of the corresponding police station’s architecture is striking. For information, the annual minimum salary for a full-time activity is 13,500 euros (also the average income in Aubervilliers, La Courneuve, Stains and Garges-les-Gonesse). This series is a work-in-progress and will soon be augmented by more photographs illustrating the varying degree of weaponization of architecture depending on the municipality, its residents, and their average income. Inventory of the Police stations in the Paris metropolitan area (limits of “Grand Paris” are the dashed white line). The numbers refer to the photographs below, to the exception of Mantes-la-Jolie, 20Km West out of the map. 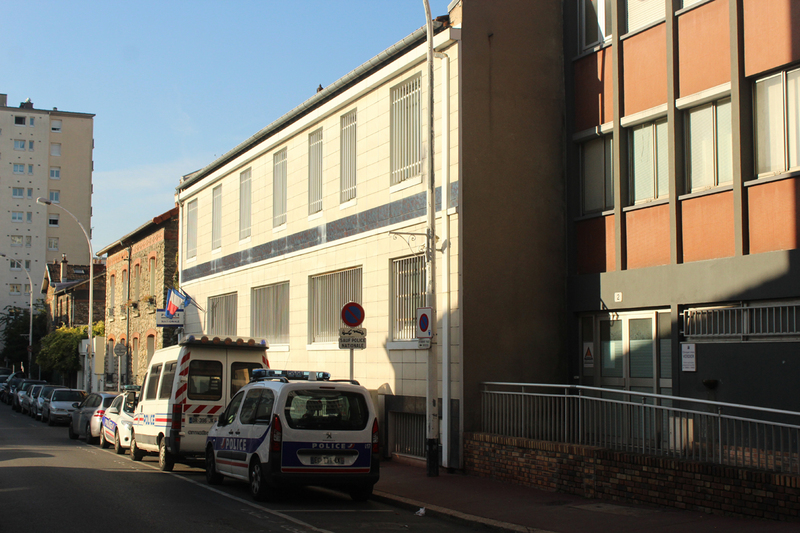 01/ Police station of Massy (Essonne). Average income per year: 22,000 euros. 02/ Police station of Antony (Hauts-de-Seine). Average income per year: 28,500 euros. 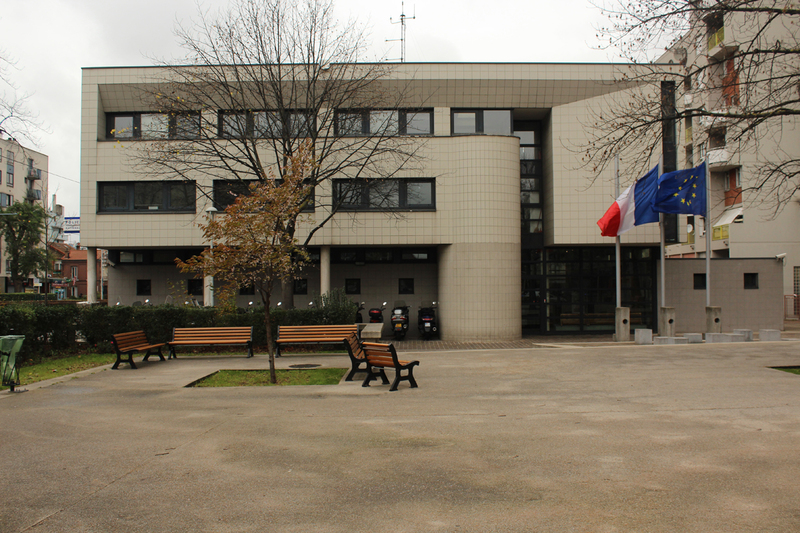 03/ Police station of Châtenay-Malabry (Hauts-de-Seine). Average income per year: 23,000 euros. 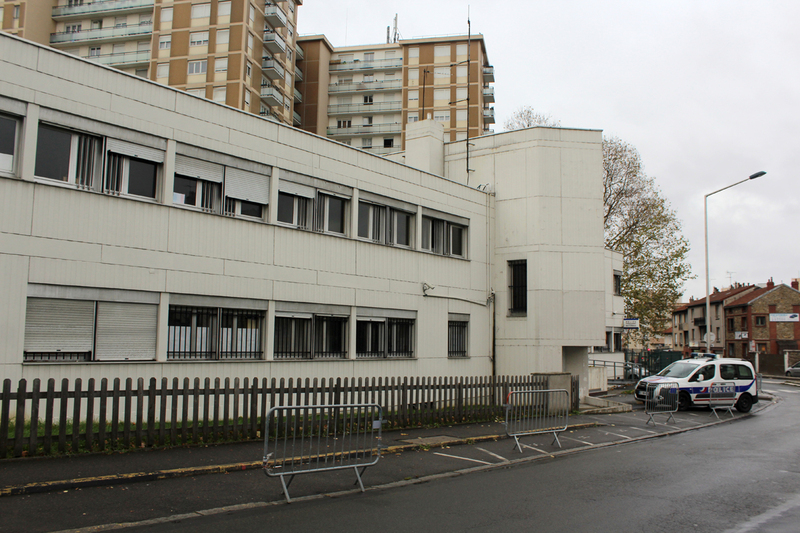 04/ Police station of Bagneux (Hauts-de-Seine). Average income per year: 18,000 euros. 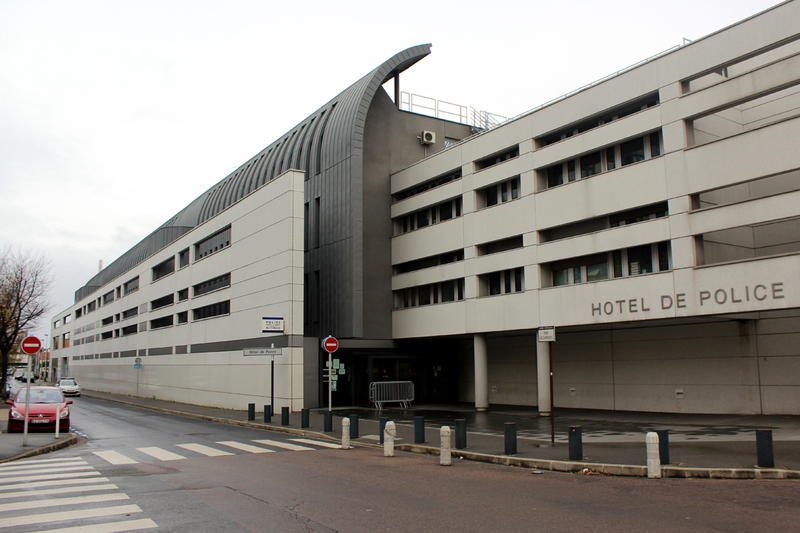 05/ Police Station of Montrouge (Hauts-de-Seine). Average income per year: 26,000 euros. 06/ Police station of Vanves (Hauts-de-Seine). Average income per year: 27,000 euros. 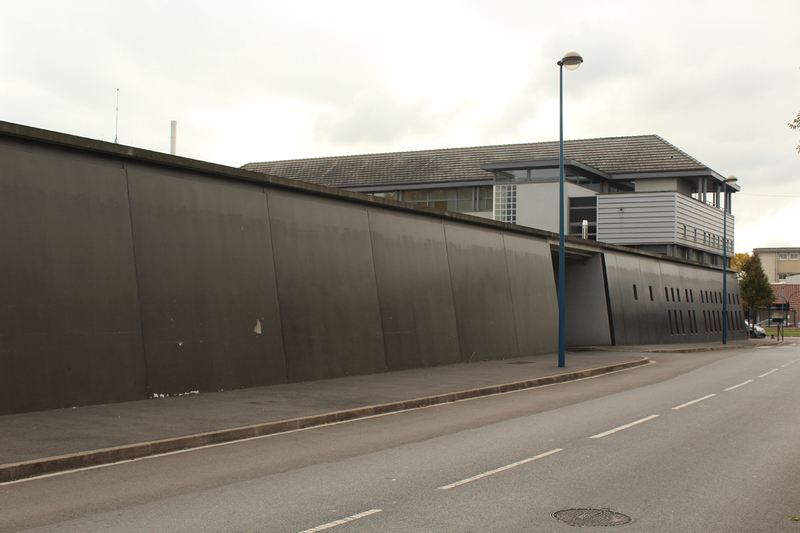 07/ Police station of Gagny (Seine-Saint-Denis). Average income per year: 21,000 euros. 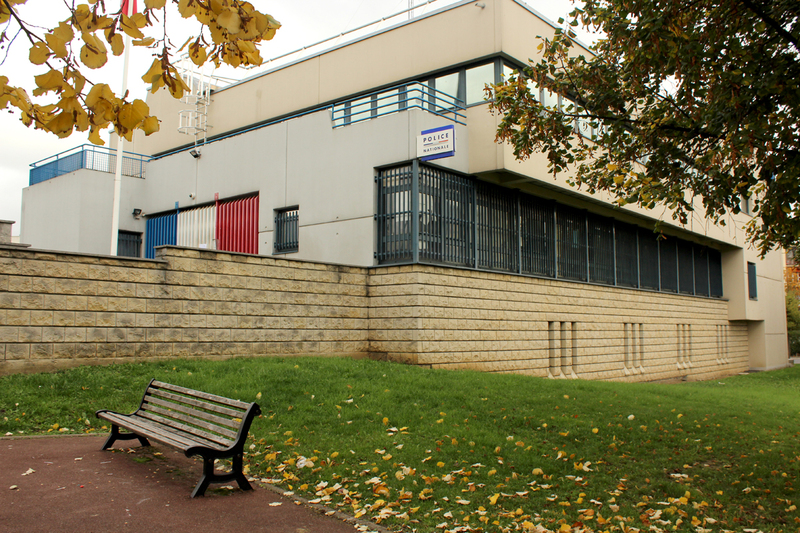 09/ Police station of Bobigny (Seine-Saint-Denis). Average income per year: 14,000 euros. 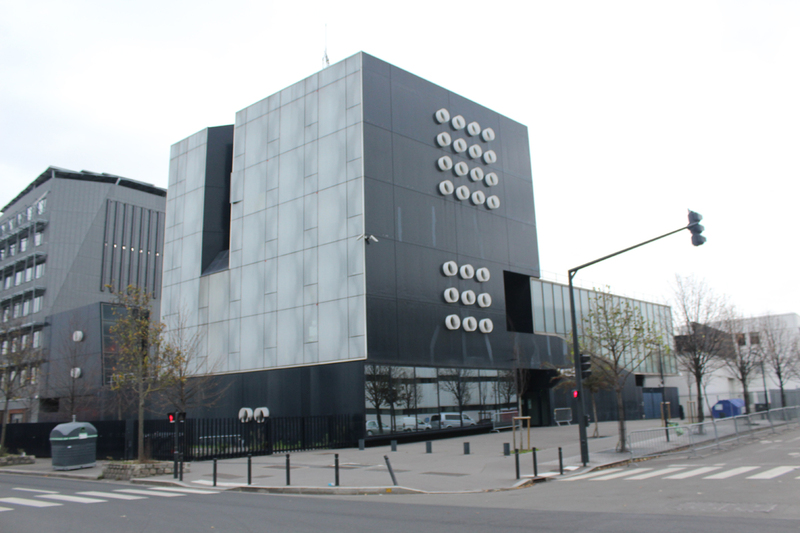 10/ Police station of Aubervilliers (Seine-Saint-Denis). Average income per year: 13,500 euros. 11/ Police station of (La Plaine) Saint Denis (Seine-Saint-Denis). Average income per year: 14,500 euros. 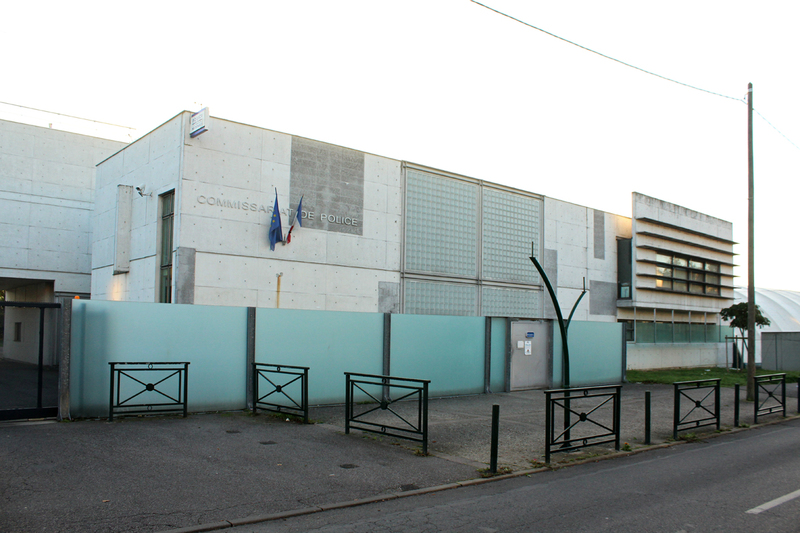 12/ Police station of La Courneuve (Seine-Saint-Denis): Average income per year: 13,500 euros. 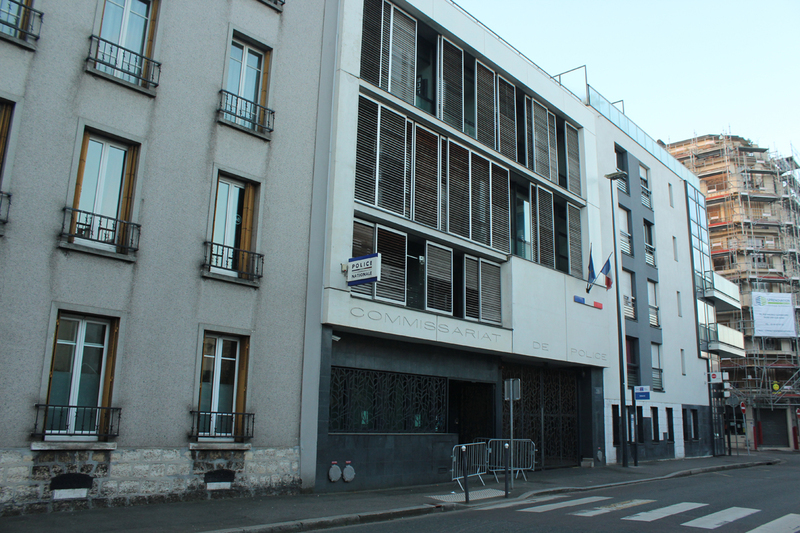 13/ Police station of Stains (Seine-Saint-Denis). Average income per year: 13,500 euros. 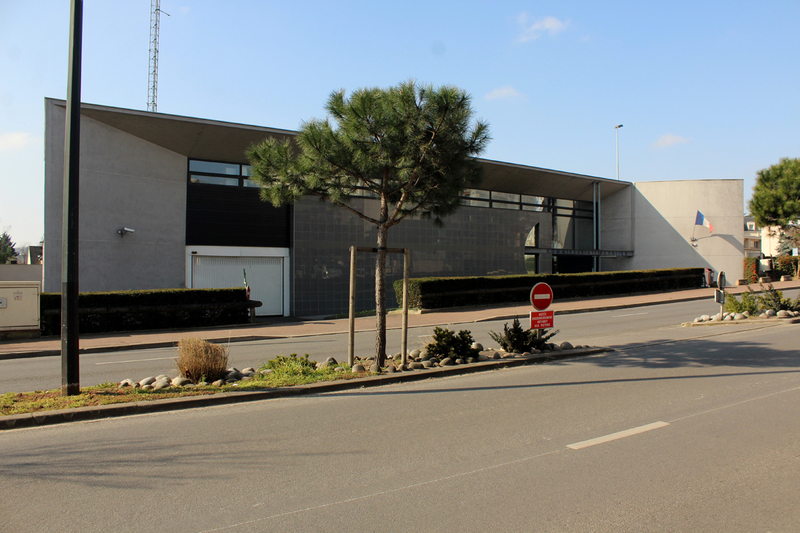 14/ Police station of Garges-les-Gonesse (Val d’Oise). Average income per year: 13,500 euros. 15/ Police station of Villiers-le-Bel (Val d’Oise). Average income per year: 14,000 euros. 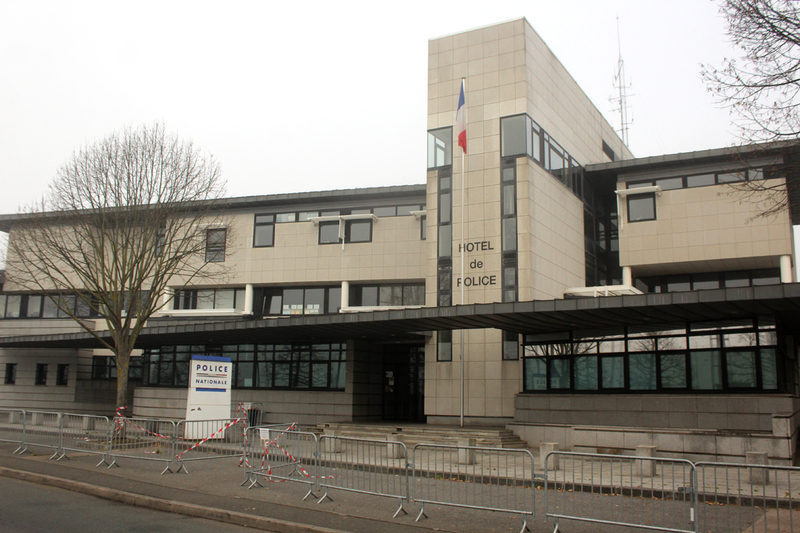 16/ Police station of Mantes-la-Jolie (Yvelines). Average income per year: 15,500 euros.